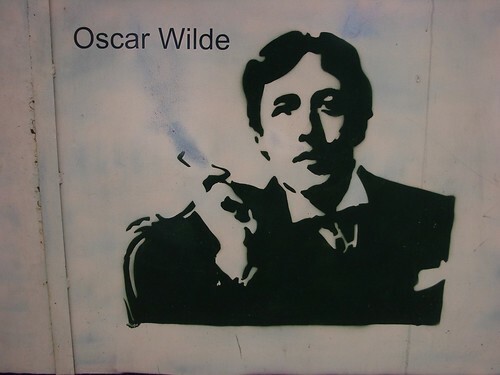 Street Art of Oscar Wilde- the original art for art's sake advocate. CC Image courtesy of bixentro on Flickr. Last week's LA Times article about the brand-new study by the President's Committee on the Arts and Humanities closes with a quote from one of the few skeptics of this otherwise widely-hailed report. Ellen Winner, the chair of the Psychology department at Boston College, takes issue with the research in the report, despite her strong support of art education. Read on to find out why an arts advocate might criticize this very popular report. Winner believes that the research is somewhat misleading, telling the LA Times that other factors are at play in student success. "You can't infer arts is causing...test scores to go up. It could be kids who take lots of arts courses are very driven students." In a 2000 article that she co-authored with a colleague, Winner wrote, "Studying the arts should not have to be justified in terms of anything else…. they are time-honored ways of learning, knowing, and expressing." As Winner correctly points out, arts advocates often do have to rely on trendy arguments and new research to make the case for arts funding. As the little guys, we often need some extra ammunition, and those tend to come in the form of hard positive outcomes. When you are fighting for your microscopic piece of the budget pie, we often feel the need to take whatever we can get in terms of an argument that sounds convincing to someone on the fence. So the "human spirit" angle doesn't end up getting much play. However, Winner's point is a solid one. Even as we use new advocacy strategies to make our case on the local, state, and national levels, it's important to keep in mind the inherent value of the arts beyond what they can deliver. Art for art's sake can’t be our only advocacy strategy, especially in These Dire Economic Times. But it is one that those of us in the trenches should keep in mind as we're fighting the good fight.